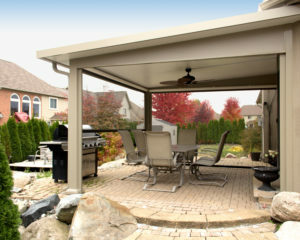 If you’re ready to introduce more shade to your backyard, consider having Pro Home and Sunrooms install one of our beautiful St. Thomas patio covers at your residence in Rochester, New York, or a surrounding area. We have proudly served the area since 1967 and stand out as the leading family-owned and -operated home improvement company because we truly view each of our customers as members of our family. When you turn to the professionals at Pro Home and Sunrooms for the installation of St. Thomas patio covers or any other of our shading products, you will instantly be able to experience the benefit of working with a reliable home improvement company. In fact, we stand by our products and installation so much that we back all of them with a Lifetime Forever Warranty in addition to the impressive lifetime transferable warranty offered straight from the manufacturer. To learn more about the stunning St. Thomas Patio Covers that we offer to residents of Rochester, NY, and the surrounding areas, contact Pro Home and Sunrooms today. When you do, make sure to ask about the financing options available to all qualifying homeowners. We have experienced excellent service and quality!...we love your company and our beautiful new sunroom too! When the work was completed we were extremely pleased with the new look and the quality of the product and the workmanship! Pro Sunroom, we found is the best. They did exactly what they said they'd do exactly when they said they would. We are extremely happy with the Quality of workmanship. Our sunroom has become the place where we spend most of our time. © 2019 Pro Sunrooms. All rights reserved.